Wheatgrass juice contains 70% "crude" chlorophyll. Chlorophyll by definition being the green pigment in plants. It is considered the "blood" of plants, due to the similarity to our blood in molecular structure. The juicers we sell extract the juice out of the blades of wheatgrass. Normal fruit and vegetable juicers will not juice wheatgrass. We highly recommend an electric wheatgrass juicer. Our favorite is the Samson, it juices wheatgrass about as well as dedicated wheatgrass juicers. 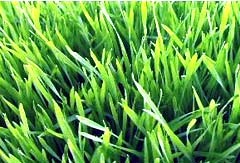 A 17"x17" flat of wheatgrass will yield from 12 to 18 ounces of juice. It should be cut when it is between 5" and 8" tall. WheatGrass Attachment - This attachment allows you to use the Champion Juicer you already own to juice wheatgrass. In general, we do not recommend this attachment, a dedicated wheatgrass juicer will do much better. Manual Wheatgrass Juicers (Single Auger) - excellent to use when the power goes out, or when there is no power! Manual Juicers for Wheatgrass and other Fruits and Vegetables- Single Auger Manual Juicers that allow you to juice wheatgrass as well as other fruits and vegetables. Some even allow to grind your own nuts into nut butter and frozen bananas into ice cream! Dedicated Electric Wheatgrass Juicers (Single Auger) - motorized, plug it in & go! Multi-Purpose Wheatgrass Juicers (Single Auger) - will juice wheatgrass just about as well as one of the single auger machines above. Will also juice other fruits and vegetables about as well as a twin gear machine. Vertical Single Auger - A revolutionary design in juicers. It takes the single auger style juicer and turns it vertically. Will juice fruits, vegetables and wheatgrass. Does not have multi-purpose functions. We do not recommend this style juicer if you want to juice a large percentage of wheatgrass, as the wheatgras shoule be cut into 1/4" pieces for best results. We recommend a horizontal single auger juicer, as listed in the category above. Twin Gear Juice Extractors - will juice wheatgrass as well as other produce. If you want the best results when juicing wheatgrass, we recommend a machine from one of the categories above. As juicing wheatgrass alone in a twin gear juicer produces excess amounts of foam. - Our pick for the "best" machine in the category. It is our recommendation to you of the best buy for your dollar.